Queen Elizabeth was succeeded in 1603 by Prince James VI of Scotland who became King James I of England. The King inherited a church that was deeply divided between the Conformists and the Puritans. To try to settle the differences, the King called a conference in January 1604. The conference failed to produce peace between the contending groups, but it produced a call for a new authorized version of the Bible. The plea was accepted by King James. Like Elizabeth, he hated the Geneva Bible, but he recognized that the Bishop's Bible was inferior. He desired to have a high quality English Bible that all his subjects could embrace. In obedience to their instructions, the King James translators did not provide any marginal interpretations of the text. They did, however, provide 9,000 cross references and 8,500 notes regarding alternative renderings or variant source texts. The King James Bible did not become the predominant Bible overnight. Scholars stuck with the Latin Vulgate and abandoned it slowly over the course of the 18th Century. The general public clung to the Geneva Bible for decades. 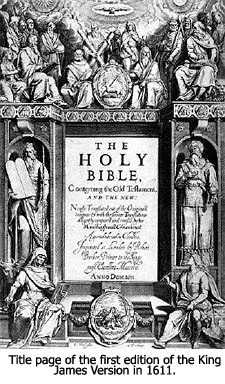 With no continuing competition, by 1700 the King James Version had become the sole English translation for use in the Protestant Churches. Over the years that followed, the King James Version went through many revisions. Most of these were to correct spelling errors and typographical errors. By the mid-18th Century the misprints had reached scandalous proportions. It was then decided that an attempt should be made to produce a standard text. The first attempt was by Cambridge University scholars in 1762. Another effort was made in 1769 by Oxford University, and that edition became the standard text that is still in use today. In the next segment, we'll continue celebrating 400 years of the King James Bible by looking at the more modern translations. 18) For a list of all the instructions given by King James to the translators, see, "History of the King James Version," www.bibleresearcher.com/kjvhist.html, pages 2-3. 19) Edgar J. Goodspeed, "The Translators to the Reader: Preface of the King James Version of 1611," http://watch.pair.com/thesispreface.html, page 5. 21) Dr. Herbert Samworth, "The King James Bible," http://www.solagroup.org/articles/historyofthebible/hotb_0015.html, page 3. 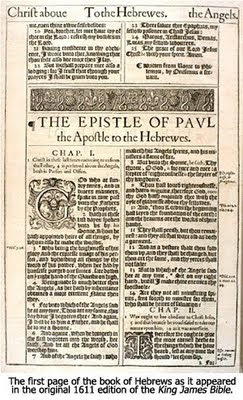 22) Wikipedia, "Authorized King James Version," http://en.wikipedia.org/wiki/Authorized_King_James_Version, page 20. Thank you for all your hard work in putting together this very informative article.